Award Winning, Rockin' Rubs, Spices & Sauces, Experience Life 1 bite at a time!! We are Glad your Here!! Aloha!! Aloha and Welcome to Our Online Store and Fan Page!! Giving you Superior Quality Ingredients in all our Products, to Create A Great & Flavorful Dining Experience. Arizona Based Company, use only the Finest Ingredients in our products, May Cost a little more but Worth It. 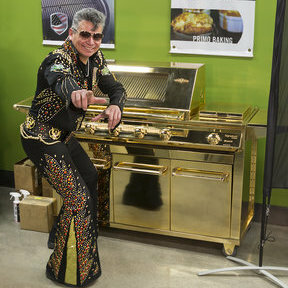 All Product approved by "THE KING" of BBQs and wouldn't be on the website if he wouldn't sell it to his Mother. This product is not for the Masses,... it is for those who have an advanced palate and appreciate the finer thing's in Life. "Happiness is the Explosion of Flavor in your every day Meals!!" Thank you for your support!! Mahalo!! Just wanted to say this Stuff is the Best!!!!! Chicken every Weekend for the last 5 weeks and we love it!!! Great Job Val! Aloha!!! "THE KING" of BBQ Distributing Began in November of 2016. From the Seed of an Idea to Enhance your BBQ Experience with BBQ Rub's & Spice's, to enhancing all your Food Experiences, on the BBQ, on the Stove or in the Oven, grilling over a Campfire, Drinking your Favorite Bloody Mary, or Spicing up your Popcorn. "THE KING" of BBQs is working with Companies around the world to distribute Only High Quality products, Giving you Superior Quality Ingredients in all our Products, to Create A Great & Flavorful Dining Experience.